News just in.... Gardening is good for you! Must be a slow news day, but regardless, someone has actually figured out just how good for you it really is. Honestly, my waist line didn't get the memo but now I'm armed with these facts, Adonis watch out! Who's been taking pictures of me? In the article I read, they suggest cancelling the gym membership and making your gardening tools your gym equipment. Good news for the budget stressed gardener, you just got a $90-100 a month raise for your enjoyment. Rakes, hoes, mowers, wheelbarrows, shovels and watering cans now become your new treadmill and dumb bells. Using each one of these tools in repetition can burn up to 300 calories a day. Just make sure you don't gulp down an icy cold soda, as many contain nearly the same amount of calories as you've just burnt off. Gardening can even lower blood pressure and cholesterol or prevent diabetes, heart disease and depression if done on a regular basis. All parts of your body are employed when weeding or digging holes for planting. 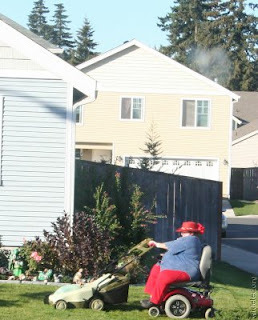 Mowing the grass with a push mower will elevate your heart rate and tone your body like a gardening gladiator. The other side of this coin is our ability to grow are own produce. Fresh and organic. However, the health implication for me, come from running after the bloody squirrels steeling the apples off my tree. Still, awareness needs to be exercised over our ability in the garden and what our level of exertion may be. Picking up rocks and bending over for long periods will result in injuries. Frequent breaks and remembering to stretch before working out will help reduce the risk, but knowing your limitations is key. Someone even did a study that showed 10-15 minutes of exertion, followed by a break of the same duration is far more beneficial than longer periods of exertion. Music to my ears, but I don't think this will fly at work. Also well known, is the fact that gardening isn't just for your physical health but also your mental well being. I find a have a great sense of accomplishment over what I achieve throughout the day, even if my body is telling me to lie down and surrender! Regardless, it is a way to escape the hum drum of everyday live. A day struck in constant gridlock can be cured by venting your frustrations while pushing the mower. All's good again. Of course, not everyone will achieve the same goals and therefore your garden shouldn't be considered the only form of exercise. Instead branch out into your neighbors yards as well or if you need to, my garden could do with a little work. His mum in picture #2 will drop him off! Don't worry its not genetic. Oh, she'll be picking him up at 8pm for his hot milk and book time before bedtime. Even the cream of the crop come with luggage. LOL. Great stuff here!! Nature/gardening is ALWAYS good for the body and spirit. :) great blog Rob! In 1726 it was portrayed as 'the noblest of any in Europe' and the garden today is of national significance. For something more stifled Runnymede is the riverside site of the fixing of the Magna Carta, truly huge with one of only a handful few effectively available plans of Jellicoe.